Buhari campaign in Edo State. 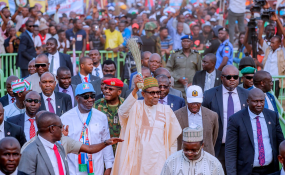 President Muhammadu Buhari on Thursday made some embarrassing blunders in his remarks in Warri, Delta State when he presented his party's flag to Great Ogboru, the All Progressives Congress (APC) governorship candidate in the state. Mr Buhari was in Delta State to campaign for re-election. Adams Oshiomhole, the National Chairman of the APC, gave the APC flag to Mr Buhari for the president to hand over to Mr Ogboru, as a governorship candidate and leader of the party's electioneering campaign in the state. "I am handing over this flag of honour to our presidential candidate," Mr Buhari said erroneously, as he was about to perform the brief task. The dignitaries who were on the stage with the president quickly corrected him. "Gubernatorial candidate," they quipped in. The president tried to correct himself but ended up saying "senatorial candidate" instead. Again, he was corrected. But still, he could not get it right. "Governortorial candidate," Mr Buhari said finally, and then thanked those who pointed out the faux pas. He handed over the flag to Mr Ogboru. As both men shook hands, the president could be heard saying, "Madam, I wish you luck" to a woman who appeared to be Mr Ogboru's wife. In his remark before the incident, President Buhari told the crowd at the political rally he was not ready to back down on his anti-corruption war. Nigeria's 'sad point', Mr Buhari said, is corruption. "I assure you, all those that have enriched themselves where they have been trusted with public funds, we will eventually get them and deal with them. "We are doing it. We will continue to do it," he said. The president, probably acknowledging the concerns raised by Nigerians on the alleged lopsidedness of his anti-corruption war, assured that his administration would not abuse public trust. "Our interest is to serve Nigeria and to get Nigerians to live together and work for our nation. God has blessed us with people and the resources," President Buhari said. "Let us realise it and thank God and work together to build our country." The opposition and other Nigerians have used the incident at Warri to raise concern over Mr Buhari's fitness to govern Nigeria for a second term. "Presenting flag to the Presidential candidate of APC in Delta State?" Ayo Fayose, a former governor of Ekiti State, said on Twitter, through the handle @GovAyoFayose. "Is it that those promoting this man do not have shame? Embarrassing outing on NTA yesterday, another embarrassment in Delta state today, shouldn't this man be allowed to go home and rest?" Inibehe Effiong, a Lagos-based human rights lawyer, posted on Facebook a video of the Warri incident and wrote, "This is the President of the most populous black nation on earth, and people are talking about the 'Next Level'. We are in trouble."